Weekends are a great chunk of time to get a significant project done, and limiting it to a weekend helps to stay on task. This blog is inspired by a how-to book on ray tracing, but that is just the initial driving example. There's been a lot of interest and positive feedback on my mini-book on ray tracing. This page is for the sequel Ray Tracing: the Next Week , available on Kindle. This method was introduced in 1984 by Rob Cook. The construction method in the book can be improved by using the surface area heuristic (SAH). When evaluating potential partitions, the one that minimized the surface area of the sum of volumes of the sub-trees is almost always good. Here is a SAH-based build that cuts on the longest axis. The program in the book implicitly samples lights so there are no shadow rays. If you want to get more efficient direct lighting you can either send shadow rays, or importance sample by sending more rays toward the lights. A general instance usually stores transformation matrices. Composite transforms can all be in one node. When scales are allowed handling the surface normals must be done with care. Here's a derivation of the ray-constant-medium intersection. It is straightforward to add nonuniform densities by adding a more sophisticated intersection method. This is covered in this blog post. It's pretty common knowledge in the ray tracing community, but not really in the intersection. In chapter 4 when you say you scale the point in the perlin constructor and you show the result images ... by how much do you scale it? I think this is it, but I will have to run it again to be sure. I'll do that. For the final scene (Chapter 9), you did not provide the parameters for the camera. Would you mind sharing so that I can reproduce a similar image? At some point in the book you say: "This is very noisy because the light is small". I have noticed right away after switching to lights (chapter 6) and rendering the very first image, that everything is incredibly noisy (and way more than your screenshots). I am trying to understand the actual reason: is it because when rays get scattered (randomly), because the light is small, it requires a lot more of them to hit the light? But then why is it that the result is noisy? I am not sure I understand what is actually happening. Thank you for your previous answers. In chapter 8 (Volumes) the code use a "isotropic" material (phase_function = new isotropic(a)). It does not seem that you defined this previously. Can you explain a bit more? Geometrically it means scattering in every direction is equally likely. But what does the isotropic class look like? What is this isotropic class? It is not defined in the book nor in the link you just sent. In chapter 3, I do not understand how to write the bounding_box method for the hitable_list class and I can't find anything about it in the book. Any help would be much appreciated. Here is my version-- I do it at construction time. In chapter 4 when you introduce Ken Perlin's trick to put random unit vectors on the lattice points, I was unable to reproduce the image shown in the book before turbulence and the "turb()" method is discussed. This returned an undecipherable image of noise. This code produced the correct image as seen in the book before continuing onto reading about turbulence. Thank you so much for these book Mr.Shirley. 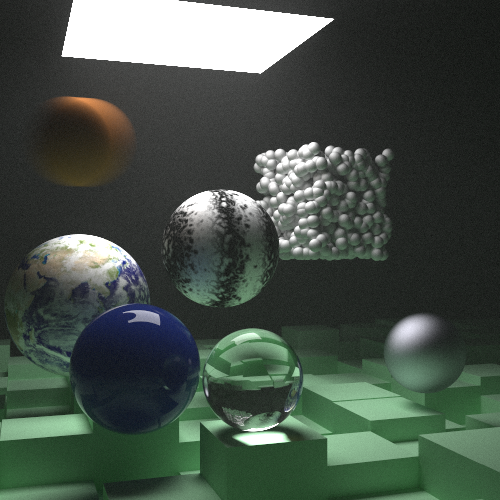 :) I'm having a great time stretching my brain while learning about ray tracing. ...which looks like it throws some lovely negative numbers into the mix sometimes, and negative numbers which become colors is not likely to end well. Thank you! had me stuck for a while.. Thank you, that is exactly the problem i have. I opened the .ppm file with text editor and noticed there were lots of negative color values, then I realized there must be some returned color values should be scaled and biased but didn't know where the change should be. After i implement BVH my render time increased more than twice. According to profiler bvh.hit() /aabb.hit()/ vec3 operator functions creates significant overhead. This is intended or somthing is wrong? not intended but could be right-- that is most definitely not a great BVH implementation. There are two main places that need improvement in the BVH presented-- the build (it would work better with a mildly more complicated SAH), and the ray-box intersection. The ray-box intersection that is reasonably easy to drop in is by Amy Williams and the code is online. But view this BVH as a placeholder with log(N) behavior and a bad time constant. Thanks Peter. Hit function change in aabb greatly helped. 434 seconds with optimized multi box hit function from Amy Williams pdf. 2015 seconds with out BVH. 4950 seconds with the basic function from the book. (last scene from first book with 50 samples. compiled with vs2015 update 3 community edition). Awesome! I am guessing that improved BVH build would help a lot too, but maybe not as much. Coupled with BVH and Amy Williams optimisation one of my scenes went from 32 hours down to 5.5 hours! Quite an improvement. However, the image quality was compromised in places due to (I believe) the fact that the random number generator is not happy running across multiple threads. I guess each thread would needs it's own generator. I implemented bucket based multithreading using std lib only, did not see any image degradation so far (I use drand48 implementation for windows). I also use a little optimized sah based bvh from link above. P.S numbers I provided above was based only on multithread implementation. P.P.S By the way in book stated that there is some links about scaling here. But i don't see any. May be I missed something. Probably I have dropped the balls and don't have them yet! But if you want massive parallelism running a ton of full images and then averaging the images themselves in a tree fashion (so for example for 1024 images first average pairs to get 512 images and repeat until you have one). Good eye! You are right. The shadow and reflection rays need to keep the time of the camera ray. Ah yes, that makes sense! Thanks for your time and reply. I now i miss something but i dont understand what exactly. Hey Dimitry. This LOOKS right to me. So that suggests a subtle bug. I would try using this code for a constant density and seeing what happens-- that might provide some debugging case where you know the right answer. Thanks for help Peter. This code, when I use it with perlin noise as density function produce result visually similar to constant density. (I setup low frequency perlin noise function on solid cube before use it on volume to get good variations). I also used same noise as color variation function for same volume and all works as i expected. Only problem is in density variation. Looks like i make it work. I post my (not sure right) solution tommorow. Excellent! That looks plausible. One issue with media is it's hard to know what's right. A debugging case I like is to make the medium **almost** constant. It should then look constant. Here is some of my thoughts and explanations about non-uniform medium. As I promised in previous post. As I understand probability density function are same for non-uniform and uniform medium. P.S Looks like this work but I am not sure that there are no mistakes in my conclusions. Hi Peter, thanks for your series of books. I have really enjoyed following the code examples and putting together the path tracer. I had an issue whilst rendering the final image. The noise_texture was not rendering properly. I was having the same issue, so thank you for this! I think there is an error in the bounding_box method of hitable_list in the second chapter of the second booklet "ray tracing: the next week." I am reading a kindle version from Amazon. In the method, there is a for-loop iterating all the boxes of the elements of the list. However the iterating index i is not being used within the loop. A correction for this error seems to be changing list to list[i]. Thank you again for the good booklets series. Love these 3 mini books! Amazing read and is helping me a lot ! On a side note, is there github repo for book 2 and 3 maybe? Can't find it anywhere. Thanks! Only problem is in density variation. Thank you for your amazing three small books!I really love them.And I am your Chinese fun.